I know you all love an interesting pancake recipe, especially a slightly quirky one that features not only a fruit, but also a vegetable. It’s been a while since I featured one here, but I was waiting for something, a combination, that would not only pique my interest, but also my appetite. Here it is. 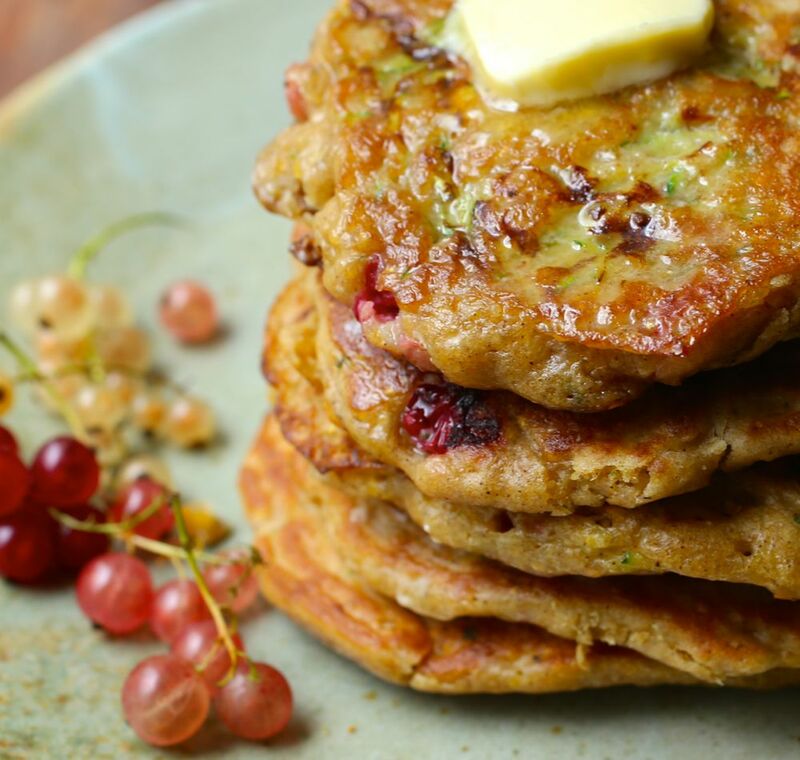 These tasty and moist pancakes owe their alluring flavor and texture to fresh currants, shredded zucchini, and whole grain cornmeal. Yes, I know it sounds like a heady mix, but all together they’re quite tasty. Pastry flour helps keep them light and a little quinoa flour adds a little nuttiness. If you prefer, use white whole wheat flour in lieu of pastry and quinoa flours. In a large bowl, combine flours, cornmeal sugar, baking powder, baking soda, cinnamon, nutmeg and salt. In a separate bowl, whisk together milk, coconut oil and eggs. Note: Make sure your milk and eggs are at room temperature. If not, the coconut oil will harden when it is combined. Add wet ingredients to dry ingredients and stir with a wooden spoon or spatula just until it comes together, but still lumpy. Do not overmix. 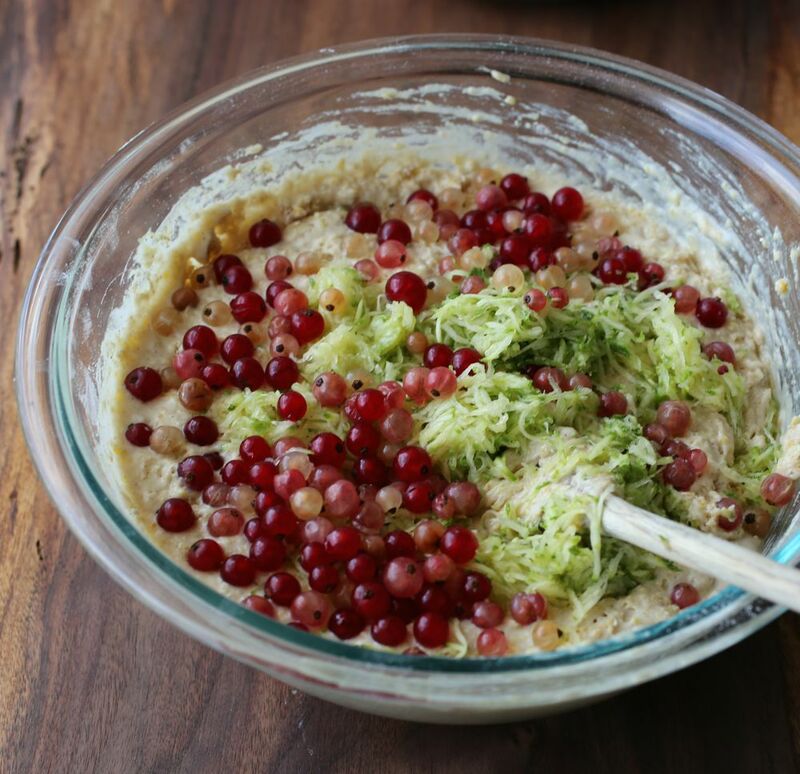 Carefully fold in zucchini and currants. Allow batter to sit for about 10 minutes. Bring a griddle or cast-iron skillet (or your heaviest skillet for best browning) to medium-low heat. Melt coconut oil in the skillet and ladle about 1/4 cup of pancake batter into the skillet. Leave at least 2-inches between the pancakes to allow the batter to spread out. 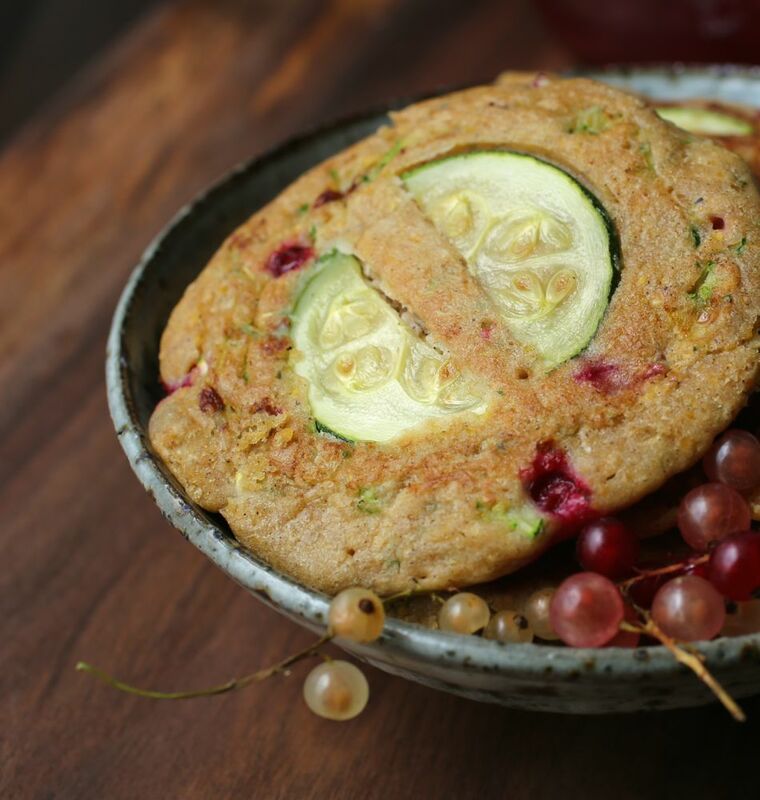 Optional: arrange two zucchini slices to cover the top of the batter. Let the first side of the pancake cook until the edges begin to dry and bubbles form on the top, about 2 to 4 minutes. Use a wide spatula (I prefer to use a fish spatula) to get completely underneath your pancake puddle and flip the pancake in one quick movement. If you notice they’re browning too quickly, lower your heat. Transfer pancakes to a baking tray and keep warm in the oven while you continue to make the rest of the pancakes. Serve warm.